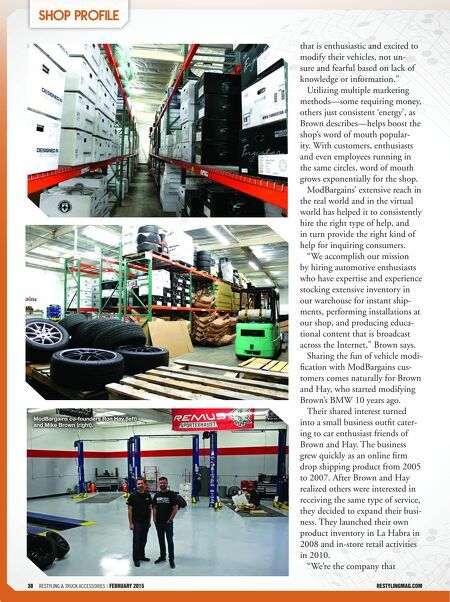 restylingmag.com FEBRUARY 2015 | Restyling & tRuck AccessoRies 39 ULTIMATE Essential business information for aftermarket professionals. INDUSTRY HEADLINES Breaking news, video clips, hot new products and much more! FEATURE ARTICLES A searchable collection of some of Restyling & Truck Accessories' best feature stories. PRODUCTS & SUPPLIERS Our online directory of top manufacturers, distributors and service providers. DIGITAL BACK ISSUES Browse past issues of Restyling & Truck Accessories in our free digital edition library. 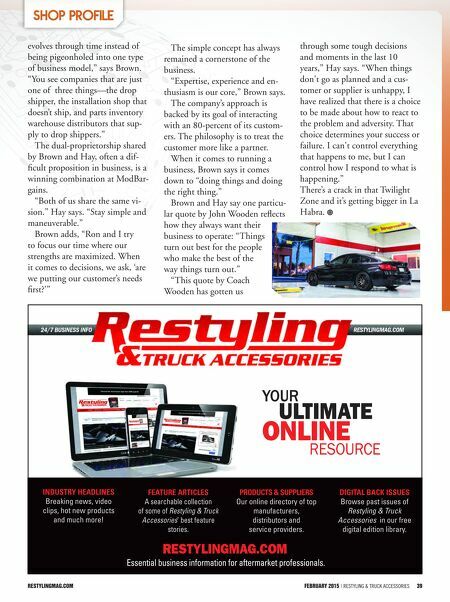 RESTYLINGMAG.COM ONLINE YOUR RESOURCE REstYlingmAg.com FEBRUARY 2015 | Restyling & tRuck AccessoRies 39 evolves through time instead of being pigeonholed into one type of business model," says Brown. "You see companies that are just one of three things—the drop shipper, the installation shop that doesn't ship, and parts inventory warehouse distributors that sup- ply to drop shippers." The dual-proprietorship shared by Brown and Hay, often a dif- ficult proposition in business, is a winning combination at ModBar- gains. "Both of us share the same vi- sion." Hay says. "Stay simple and maneuverable." Brown adds, "Ron and I try to focus our time where our strengths are maximized. When it comes to decisions, we ask, 'are we putting our customer's needs first?'" The simple concept has always remained a cornerstone of the business. "Expertise, experience and en- thusiasm is our core," Brown says. The company's approach is backed by its goal of interacting with an 80-percent of its custom- ers. The philosophy is to treat the customer more like a partner. When it comes to running a business, Brown says it comes down to "doing things and doing the right thing." Brown and Hay say one particu- lar quote by John Wooden reflects how they always want their business to operate: "Things turn out best for the people who make the best of the way things turn out." "This quote by Coach Wooden has gotten us through some tough decisions and moments in the last 10 years," Hay says. "When things don't go as planned and a cus- tomer or supplier is unhappy, I have realized that there is a choice to be made about how to react to the problem and adversity. That choice determines your success or failure. I can't control everything that happens to me, but I can control how I respond to what is happening." There's a crack in that Twilight Zone and it's getting bigger in La Habra.